Since our launch in August, we’ve been hard at work to bring more great content to Google Catalogs. Today we're excited to announce that we’ve doubled our collection of catalogs to include more than 100 brands and 300 individual issues from the catalogs you love, like Williams-Sonoma, Sephora and Nordstrom. 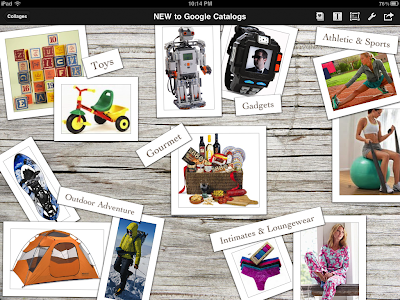 Google Catalogs lets you create a collage of your favorite items from across many catalogs. You can even share your collages with friends and family - a visual way to show them what’s on your list this holiday season! We’ve also added a number of great brands to our existing categories, including: Barneys, Tory Burch and Trina Turk (Fashion & Apparel); BeautyBar (Beauty); Blu Dot, FLOR, and Ballard Designs (Home); Hanna Andersson, CWDkids, and Serena & Lily (Kids); and Garnet Hill, Uncommon Goods, and Wine Enthusiast (Gifts). In the mood to kick off your holiday shopping? 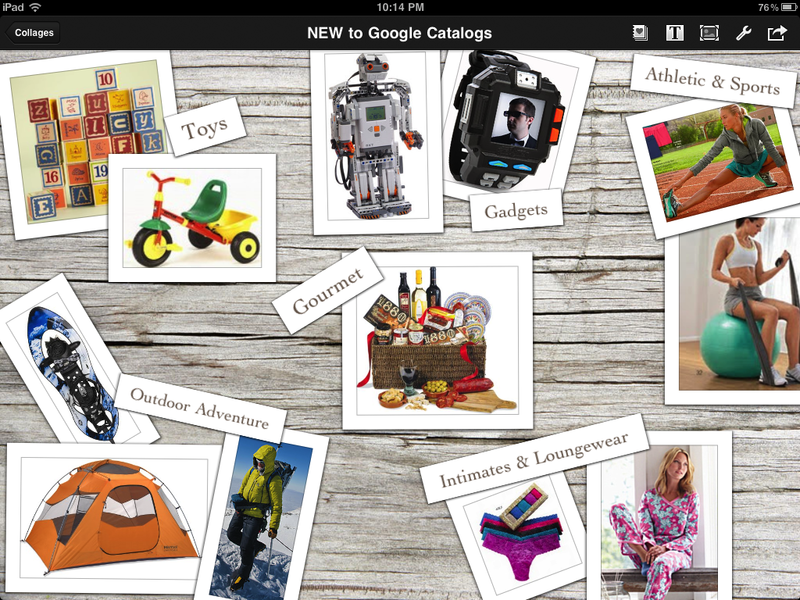 Visit the App Store to download the free Google Catalogs app for iPad. When is this coming to Android? You would think the creators of Android would get a cool app like this on the platform. Why can't I find it in the Android Market? Agreed. It's beyond bizarre that this is an iPad exclusive. Yeah, like StrifeJester said...kinda funny that the makers of Android wouldn't put this on their OS first instead of that other devlish device. When can we expect an Android version?!! Tablet optimized too? Yes, I "+1" for an Android version! Would it be easy to add to this catalog for business mobiles? How is it even Android's creators are treating it as a second-class operating system? Apple would never do something like this to one of their own brands. So wonderful... So awesome and high speed.... Cuts down on so much wasted paper. Love using the app on my xoom......... oh wait... that last part was a lie. because google opted to play the stereotype of apple fanboys, and not bother releasing it under its own OS. Way to google. When is this coming to Android already?? Really looking so beautiful and when it come on the market. will that be available for Iphone ? if there will be so i would like to download this Iphone application.